Today is National Hugging Day. Seems there is a National Day for everything. I posted this photo on Facebook in honor of the occasion. It’s one of my very favorites. The story is interesting and, I think, worth sharing. Ben and I were always so happy to meet Mickey and Minnie. As his ALS progressed, he still tried to walk to see Mickey. I knew that it was getting bad when he stopped trying to walk and just rode his electric wheelchair up to Mickey. I was always the one who got super excited to see my friends. In this photo, we had just entered the room and were greeted by Mickey. He actually spoke to us. I was just shocked and laughing. What you cannot tell by looking at the pure happiness on my face is that this picture was taken on our last visit to Walt Disney World in July 2014. It was a truly wonderful visit, but stressful because Ben needed much more assistance (we brought a paid caregiver with us) and because we knew in our hearts that it would be our last visit. You can read more about that visit by clicking here. The Magic Kingdom is very accessible, but making sure that Ben had what he needed, that there were accessible bathrooms nearby and that Ben would be able to fully enjoy himself did come with stress. Getting to meet Mickey without any issue and with Ben feeling truly delighted gave me a feeling of success and relief. What you also don’t see in this picture is that I whispered in Mickey’s ear that we really needed some magic. Mickey just had to look at Ben in his electric wheelchair- unable to speak very clearly, very thin but with super swollen feet- to know there was a medical issue. Mickey held me tight and he patted my hand. He and Minnie gave Ben a lot of attention. It was emotional and it was beautiful. I needed that hug. I needed to believe that Mickey could help. I believe the Disney magic did help. No, it didn’t cure Ben’s ALS, but, being at Walt Disney World brought Ben such happiness, it allowed him to feel free, and, as Ben described, he forgot his problems, which is saying quite a lot. We had four years after his diagnosis during which we were fortunate to enjoy several visits to Walt Disney World. I do call that pixie dust. So was the hug. I feel it’s an important story to tell because we never know what’s going on in someone’s head or their story. I love that this photo captured a very vibrant smile before the tears that came with the emotion. 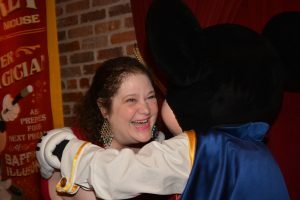 That photo reminds me that a hug from Mickey Mouse came with all of the dreams, wishes and comfort that is Disney magic. That hug was compassion. We all need to show and to feel that. Mickey didn’t have to say anything, didn’t have to offer any advice or judgment- his hug was the compassion that we needed. This is another favorite picture of mine- Ben loved Sully, and when Sully saw Ben in the electric wheelchair, he ran over to him and offered to help him up. 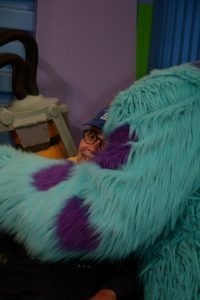 Sully gave Ben the biggest hug, which made Ben so happy. You can just see his inner child shining in this photo. It absolutely delights me to have these memories. I send everyone a big hug of compassion on this National Hugging Day! 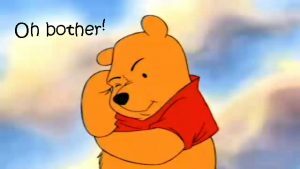 Friday, January 18 was Winnie the Pooh Day, and it was ironic, because on Thursday, I had an “Oh, Bother” moment. I have written a lot about grief and how incidents unexpectedly trigger setbacks. Last week, after four days of horrible dizzy spells, I decided to go to the doctor. It takes a lot for me to agree to go to the doctor. I am afraid of doctors, afraid of pain, afraid of the anticipation of anything and everything related to the visit, especially if blood tests are involved. Crystal Pavilion at Walt Disney World, May 2010. We took this trip right after Ben received his ALS diagnosis. We were always Mickey Mouse fans! Today, January 13, 2019, marks 27 years since my mom, Sandra, or Sandy, left this earth. There is not a day that I don’t think of her. I talk about her often, and so much so that some people do not realize she’s gone, or for how long she’s been gone. I don’t know if that is good, or “healthy,” but she is so much a part of me. This is never a great day. To the people who say that I should not be so affected after 27 years, I say that we all handle things differently. Dates are important to me. I choose to take these anniversary dates to remember my loved ones. Grief after all these years is different than grief for my dad and Ben. Those losses, within the last five years, are still closer to the surface, and the sadness hovers very closely, and setbacks are unexpectedly triggered. Also, my mom was the first person I lost and we were extraordinarily close. Because she died suddenly, it was an indescribable pain to have her ripped from my life. Losing my grandma was hard because I grew up with her and I knew that her loss would begin the complete dismantling of my family. I knew too well what grief was when my dad was dying. I knew the process that I would endure. Maybe it helped slightly to be able to intellectualize it. I grappled simultaneously with the impending loss of my dad and Ben, yet each loss affected me differently, though intensely, and I have written extensively about it in this blog. Losing my dad was losing my closest family member. I was losing my childhood. I was the Daddy’s girl who lost her Daddy. At the same time, my dad was ready to leave this world, and I had accepted that despite the pain it caused. With Ben, I was losing the man with whom I wanted to grow old. 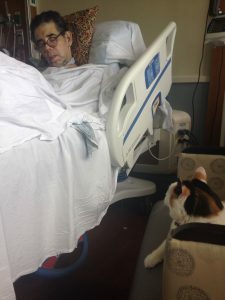 I had watched ALS take away so much of Ben’s quality of life and knew that only he could decide how to live and die with that disease, and that hovered over our daily lives, so, in some ways, I dealt daily with grief even before I actually lost Ben. I was, and continue to be, devastated by the time that he was denied and that we were denied. On the anniversaries of these losses, I do think about all of this, but I don’t anticipate how I will feel, I don’t punish myself, I don’t feel obligated to act any particular way. I will say that, this year, as every year, on this day, I woke up with the vivid memory of how my dad called me and said he thought my mom had died and the ambulance was on the way. His follow-up call confirmed it. I can’t help but lament the time that we lost and that my mom never met Ben. But, I never lose sight of how lucky I was to have my mom. She was a truly selfless, beautiful and very adorable person and mom. I love that my childhood friends have good memories of her, too. In this clip from the live action Cinderella, Cinderella’s father advises her that they must always cherish their home because her mom was the heart of it and they must honor her. This scene touched my heart. I cherish my memories to keep my mom’s spirit alive and honor her. I get my childlike enthusiasm from her and, I believe, my natural caregiving skills, which even extend to my students. 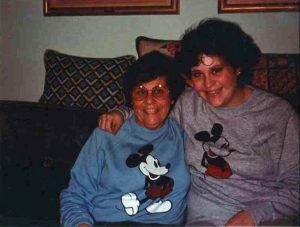 Of course, I embody her love of Mickey Mouse and all things Disney, but I hope that in some small way I have followed her example as a person. I do know that she is always with me. My mom died of a sudden, massive heart attack at the age of 59. She was way too young. The day before she died we were playing outside with our Standard Schnauzer, Dulcie. There are no hospital memories, or memories of seeing her ill. I’m grateful that my last memories of her are of her laughing. However, there was no opportunity to say goodbye. She was just gone. My mom and I were very close, or, as everyone said, attached at the hip. My dad always said that he loved to listen to us giggle. She was a child at heart and I get that spirit from her. She loved Mickey Mouse and Paddington Bear and she loved children. Children loved her, too. She was a teacher at our local early childhood school and she loved when kids would greet her when we were out shopping. People laughed that we spoke on the phone many times every single day. We went to the theater and ballet together. Our excursions to NYC from Long Island for the holiday windows and the after-Christmas sales were epic, strategically choreographed events. We had so much fun. Frankly, I could not imagine living after she died. I loved her and she loved me, unconditionally. When I was a caregiver, juggling responsibilities for Ben and my dad, I realized how hard my mom worked, at a time when there was no real acknowledgment of the role of caregivers. My mom was at her core a natural, nurturing caregiver. She took care of my dad, brother, our dogs and me, as well as my grandma, who lived with us, but was also responsible for looking after my great-grandparents, great-aunts and great-uncles, and even my cousins. She even knew the treats that my friends liked and made sure to have them on hand at all times. She took care of everyone in myriad ways. My mom was the most selfless person I have ever known. 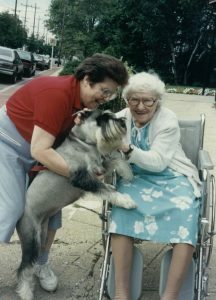 My mom visited my great-aunt, Tanta Rosie, with our Standard Schnauzer, Dulcie, almost every day. 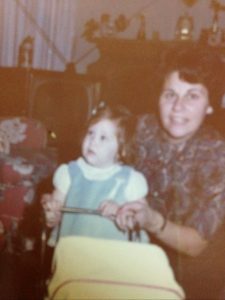 I realize that in many ways, my own caregiving days started when my mom died. I followed her example and began looking after my grandma, my dad, my great-aunt who was in a nearby nursing home. I was constantly on the phone with my grandma and my dad and helping them tend to various chores. I also loved and kept in close touch with my great-aunts and great-uncles. I went home every weekend to help in any way I could, and sometimes that was simply keeping everyone company and making them laugh. For a change of pace, I often brought home treats from Zabars or other NYC places. My grandma did not want to be cheered, and I understood that. I don’t think that anyone fully comprehends the loss of a child unless they experience it. My aunt, my mom’s older sister, also visited every weekend. But, after a sudden death, everyone floundered and tried to pick up pieces while still in shock and feeling profound sadness at the loss of the key person in our family. As in any family, the dynamics led to tensions that were, at times, explosive. I found that, just like I believe my mom would have done, I spent my time with them being a cheerleader and my private time at home collapsing in grief. Sometimes I came home, sat on the sofa and cried, and at other times I dropped my bags and took myself to a movie just to escape. As time has passed, I think mostly of the wonderful memories of my mom and our time together. So much who I am and what I do reminds me of her. I get my Peter Pan-like inner child spirit from her. 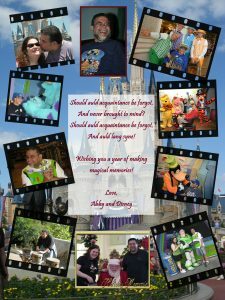 You won’t be surprised that Disney played an important part in our relationship, too. One of my favorite memories is when she called me from Walt Disney World exclaiming, “Abby, I met Mickey!” Another is watching and giggling through “The Little Mermaid,” especially because my grandma was straight-faced and completely baffled by our amusement. I proudly say like mother, like daughter! I am not ashamed to say that I still miss my mom terribly. It remains a wound that is easy to open. When watching movies, I often cry at the mere mention of mother daughter love or the passing of a mother, and Ben intuitively handed me tissues in these instances before he even saw tears. Of course, that made me laugh through my tears, and that was a good thing. 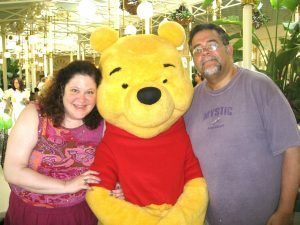 Ben never knew my mom, but he knew how important she was to me and it touched my heart that he always marked in his calendar her birthday and this anniversary and he would plan something Disney-related, like our date to “Beauty and the Beast” (click here for that post). I enjoyed the movie “Brave” and feistiness of Merida as she searched to find herself. Fortunately, I never had big issues with my mom. But the scene in this excerpt made me cry because it says it all. Even after 26 years, I just want her back. I have struggled, I have adjusted, and I have had to accept her death. Now, I take comfort in knowing that she’s always been with me and always will live in my heart. On this day and always, I love you, Mommy. Sometimes you just need some Bibbidi Bobbidi Boo. This is one of those times for Disney and me. In my last post I was worried about Disney as I faced 2019. My worries have escalated. I took her to the veterinarian during the week. The vet believes that she has cancer that is affecting her spine and that’s why her legs are weakening. There is nothing that can be done for her because medications would damage her already failing kidneys and cause her diabetes to go out of control. 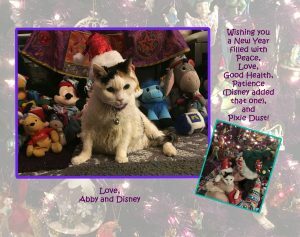 Her veterinarian, Dr. Napolitano, is wonderful, and she described Disney as an impressive girl- at 17 years old and with so much wrong with that little body, she is a fighter. But, she’s still my baby. Disney was given an injection, and I was given a prescription, to help with the inflammation that might ease her walking. Now, it’s a matter of time. Visiting hours for Disney during one of her hospital stays. I see a very slight improvement in her walking, and she is persistent. She climbs onto the sofa and the bed and likes to be near me. Her appetite is good and she was very excited to eat turkey, probably her very favorite treat. She’s not quite herself, but she is not as withdrawn as she had been, so maybe the medication is helping. Dr. Napolitano says these are good signs. I am spending a lot of time giving Disney attention and love, but the sadness looms. Watching Disney, doting on her and worrying about her certainly has me pretty stressed. 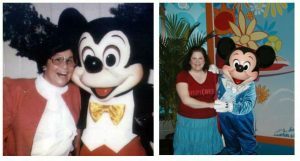 I find that I am not only dealing with the impending loss of my sweet Disney, but I am also reliving the terrible parts of caregiving and anticipatory grief that I experienced during Ben’s battle with ALS. 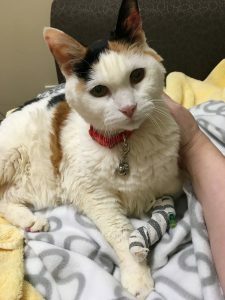 On Friday, I spent the day at work preoccupied with how Disney was doing at home- if she had fallen, if she was in pain, if she was scared to be by herself if she didn’t feel well. That brought back memories of the years of being at school with my phone in hand, hoping that my phone would not ring with an alert that my dad or Ben were having a crisis. Yesterday, I did go to the theater with a friend, but I was distracted by thoughts of how Disney was doing at home. I felt the same guilt about going out that I felt when I arranged to go out while Ben was ill. Once again, there is no relaxation at home. The pain of those memories, which has dulled but has not been forgotten, has once again become vivid. Also, I feel like I have once again stepped back to being Abby who is caring for an ill loved one. When I started working at my new high school, no one, except for a few teachers who knew me prior to this position, knew about Ben and my dad. I could shed my reputation as the caregiver or the griever. But, here I am again. I do appreciate the concern shown by my friends, I just don’t want to be “that” Abby again. 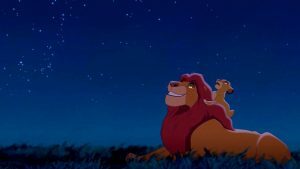 Timon from the The Lion King was right when he told Simba, “Sometimes bad things happen and there’s nothing you can do about it.” I know the realities. Disney is seventeen years old. She’s been ill for quite some time. She was diagnosed with diabetes about a week after Ben died. Since then, it’s been one medical problem after the next. Despite this, she’s had a really good life and she’s brought me so much happiness and comfort. She is simply a very sweet cat – beautiful inside and out- without any of the negative qualities attributed to cats. She’s kind of like a needy toddler who always needs her Mommy. She was always there for cuddling when things were awful with my dad and Ben and when I looked in her big green eyes I knew she understood what was in my heart. When Ben was in the hospital for those six weeks, I was so grateful to return home to her. Importantly, she is, actually, my one remaining connection to Ben. Disney was here as Ben’s ALS progressed. She watched intently as his walking became unsteady. She went to him when he could no longer go to her. She was even in the hospital to say good bye and watch over him. And, here I am, watching over Disney in the same way, trying unsuccessfully to simultaneously ignore and accept what I know is happening. Disney watched Ben throughout their visit in the hospice, even when he slept, as pictured here. 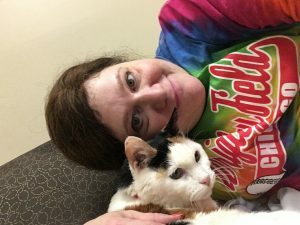 I have pushed through the bad days as I navigated the Inside Out of emotions in caregiving and grief (click here for prior post) and I am constantly reminded and reassured that I can step back into life. Writing these posts helps me to sort through issues as they arise. Maybe that’s why I am so shaken by the way this event has thrown me so far back into the depths of grief. Ben made the choice of how he would live and die with ALS. I will have to make the choice for Disney. I want to be sure that she is comfortable and that I am not being selfish and keeping her here when I should let her go. Maybe I am too obsessively following her, lifting her so she does not have to climb, keeping a close eye on her and listening to every sound, talking to and cuddling her. 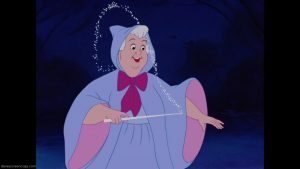 I wish I had a fairy godmother who could bring us some Bibbidi Bobbidi Boo, but maybe Disney and I are each other’s fairy godmothers, and even though we don’t have actual magic, we are always there for each other with all the love in the world. 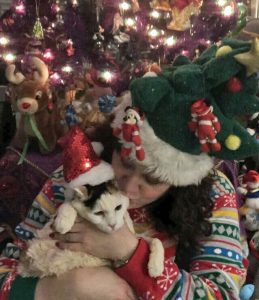 Disney and I in our recent holiday photo. She was very patient about my enthusiasm for the Santa hat. Another New Year’s Eve. It was never a big deal for me. I’m not a party girl and Ben was not into partying. I enjoyed finding a new recipe and making a nice dinner and then we would settle in and watch a movie. Everything changed when Ben was diagnosed with ALS. New Year’s Eve became depressing for us. I would try to hide my tears at midnight, and Ben couldn’t muster enthusiasm. For us, we didn’t look forward to a new year and what it might bring. We wondered if it would be our last new year’s eve together. There was no way to know that our last New Year’s Eve would be December, 31, 2014. But, how wonderful it is that I can look back now and say that it was a very fun night that reminded us of the romantic, fun, and nutty times that defined our relationship. 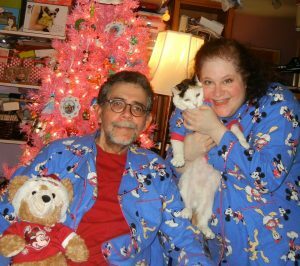 I ordered matching Mickey Mouse and Friends pajamas for us and even for Disney (from Pajamagram.com) Ben always loved the fireworks at Walt Disney World, and I found a toy that supposedly simulated fireworks, with sound effects and LED light “fireworks” that were activated by a remote control. We played the soundtrack to the “Wishes” Magic Kingdom fireworks show and Ben chose the sequence for our fireworks show while we had our photos scroll on his computer. It was pretty hilarious to pretend we were at the Magic Kingdom as we watched these pretty unconvincing fireworks splash on the wall. There is a brief video below. Don’t think it’s the video quality or the color calibration on your monitor, the fireworks really were that bad! It felt almost magical to laugh and enjoy the evening. And, it touches my heart still, that Ben woke up the next morning smiling and saying that he had so much fun. That silly celebration is now part of my treasure trove of beautiful memories of moments sprinkled with pixie dust. It’s a good lesson to let, or make, good times happen and to cherish happiness and smiles. Now, New Year’s Eve is a time to reflect. The first year after Ben passed away, I busied myself making a tribute card and featuring “Auld Lang Syne.” It was a positive way to keep Ben with me and keep him in the hearts and minds of others, give myself a purpose, and focus on happy memories as I sorted through our many photos to pick the perfect ones for the card. The second year, I struggled with how to make a card that did not include Ben. It was truly heartbreaking and I didn’t know what felt appropriate. My solution was to include photos that he loved. Last year, I simply had little holiday spirit. I took a picture of Disney but did not even print any out for mailing. I just wasn’t up for it and didn’t want to put on a happy face. This year has been another setback. Disney is not doing very well. I find myself in the same position I was with Ben- wondering if this is our last New Year’s Eve. I did make a card this year but it was bittersweet because I found myself making the card because I feel like it may very well be our last card. It’s breaking my heart. While some people might find it outrageous that I could put a cat in the same category as Ben, I assure you that Ben would understand, as any animal lover would, and as Ben understood how my family was about our furbabies. I’m angry, sad, frustrated. I have largely gotten to a good place in my life, balancing past and present and looking to the future with cautious optimism. Watching Disney struggle as her legs weaken and administering all her medications makes me so sad. I promised myself and her that I will not let her be miserable. We aren’t there yet, but I am worried about her. I am trying to balance optimism with realism but I already recognize the anticipation of grief and I’m trying to replace it with love in the present for this little girl who has been through so much with me. So, I’m sitting here tonight not looking forward to the stroke of midnight. But, I will wish Disney a happy new year, hug her tight, and make our time as meaningful and good as possible. I will spoil her even more, if that’s even possible! I will try to remind myself of the good New Year’s Eve that Ben and I shared and of how much I have grown as I’ve come through the worst part of grief. And, I will wish, in my Disney way, that 2019 brings some kind of peace. I hope that everyone will conjure good memories and good thoughts, and create the most meaningful, if not happy, new year’s eve. I wish you and yours peace in 2019.